LEIPSIC — “Feels really good. We’ve had a really busy last couple of years,” begins Leipsic Mayor Kevin Benton when asked about his village earning the 2019 Red Rose recognition. 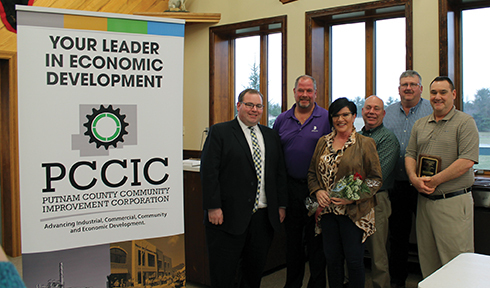 The award was presented at the Putnam County Community Improvement Corporation’s annual meeting, held last Thursday, April 4 at the Leipsic Hunting & Fishing Club. Mayor Benton was then asked what challenges the village and its wider community faces in the coming year or years ahead. This projected $400 million dollar expansion, Mrs. Sealts noted, spurred $9 million in public improvements, including a seven-mile waterline and pump station for the industrial park where Pro-Tec is situated. She also spoke of a study that looked into rising electric rates at the Leipsic Reservoir that resulted in an onsite generator and 200% reduction in monthly electricity costs. The village earned praise as well for its successful application for a federal grant that will fund 95% of the cost of a second new fire truck for the village to be delivered in 2019. At the state level, the village worked with Representative Jim Hoops, and Senator Rob McColley to secure $75,000 in capital funding for the construction of a canoe and kayak launch at the Leipsic Reservoir, along with replacing the tennis courts at Buckeye Park. Village employees did their part as well, doing all of the construction work outside of pouring concrete for a curb replacement project that resulted in project costs being cut in half. Village workers also partnered with Tooman Roofing and Painting to paint the downtown area’s street light poles, avoiding the cost associated with full replacement.